Mike gave this recipe a 5-Star rating. The flavours were fabulous, I would use this sauce on any type of ribs or chicken, there were no leftovers! This is definitely a keeper. Put the ribs in a very large pot add enough water to just cover. Bring to a boil, skimming off any scum on the surface. Add the peppercorns and 1 tablespoon of salt. Cover and simmer over low heat until the meat is tender but not falling off the bone, 1 1/2 – 2 hours; drain. In a medium saucepan, combine all of the ingredients and bring to a boil. Simmer over very low heat, stirring frequently, until thick and glossy, about 15 minutes. 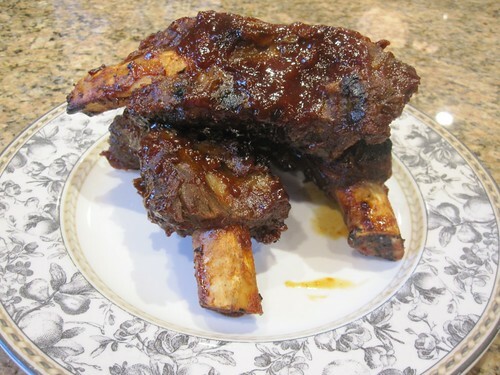 Light a grill or preheat the broiler, arrange the ribs on baking sheets and brush them with the sauce. Grill the ribs or broil 10 inches from the heat, turning and brushing with sauce, until lightly charred, 10-15 minutes. Serve with the remaining sauce.